The Blueshirt blogosphere is quietly crossing all fingers and toes and reiterating over and over how 'you better be good for goodness sake'. Everyone is thinking and no one is writing. What is the big secret that everyone spoke of ad nauseum all summer and now afraid to jinx? My inner-Dark believes the former Toronto Maple Leaf Captain will be a Blueshirt by Friday of this week. Simple. My source (a.k.a. my brain) tells me this is a done deal and fellow Swedes Sjostrom, Lundqvist and once-rumored linemate Marcus Naslund all escorted Mats out of the Garden Saturday night - coming off another God da*n shootout victory - proving that the team is a contender missing and actually in need of the "Sundin factor." He would bring an improved power play unit, locker-room leadership and guts. Drop and/or trade Prucha & Co. to clear a couple more million and it leaves Mats a respectable salary for a half and post-season. Though, there are hilarious comments and rumors of Sean Avery coming back to the Rangers (Sorry bro, we finally left your attitude with Dallas) --- bad timing for such rumors and unfortunate for Sean because the Rangers now need to clear and dump salary cap limit to bring in our only hope - the new Broadway Savior -- a guy who has never won a Cup. We'll take him over the instigator. People...hear me out. This Sundin business is happening. It's real. When he signs, maybe I'll stop bitching. Or not. 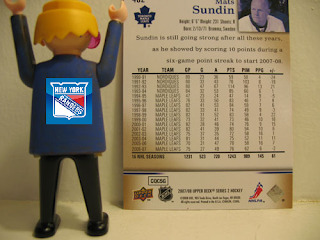 Welcome Mats Sundin, our next "defensive specialist". How painful would that be? How many players would this have to happen to, before Renney finally gets Sh*tcanned? I understand the drawback is Mats doesn't play defense. Clueless votes no. I stand corrected. It's even more sad to call it the first goal in ...what? 23 attempts? Well it is official all right. Sundin just signed with the Canucks. Oh well, maybe we can still sign Shanny? Or is it too late for us with him too?